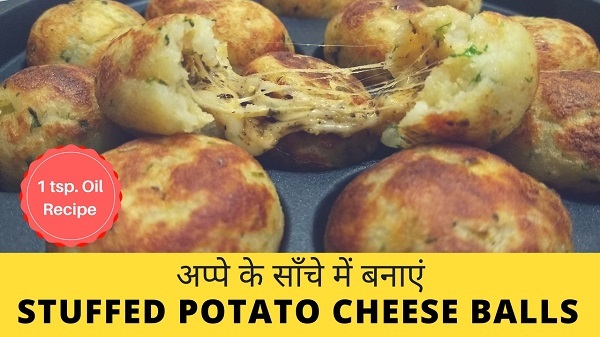 Stuffed Potato Cheese Balls made on Appam Patra. It’s made using just 1 teaspoon Oil to make it more healthy snack for kids. 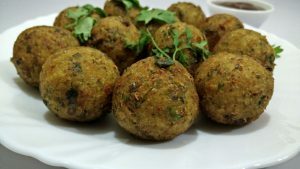 These balls are made with Boiled Mashed Potato mixture with added Corn Flour and Bread Crumbs so that it can hold the shape while stuffing. Cheese Stuffing made from Mozzarella Cheese and Processed Cheese + some spices added spices. Follow this recipe to make easy & quick yummy snack at home. Boil and mash Potatoes and keep aside to cool down to room temperature. To prepare Cheese Stuffing, add both Cheeses in a bowl. Add Garlic Powder, Chilli Flakes and Mixed Herb, mix well and keep aside. Take mashed Potatoes in another bowl, add Corn Flour, Fresh Coriander, finely chopped Green Chillies & Salt. Add Bread crumbs as required and prepare a stiff dough. Apply some oil in your palm and take a small portion of Potato mixture. Flatten it in your palm, add some cheese stuffing and cover from all sides. Roll into a ball using your palm, make all Potato Balls in the same way. Heat Appam Patra over medium flame. Grease Appam Patra with very little oil. Add Stuffed Potato Cheese Balls in cavities and cook for 3 – 5 minutes until they turn golden brown in the bottom half. Flip the balls upside down and cook until golden brown. Remove Balls to a serving plate and serve hot with Tomato Sauce.